It is quite possible to come up with slightly different definitions of the big 5 traits and to attach more importance to some of the facets than to others. This is an area that lends itself to endless debate and keeps many academic psychologists in work. As well as providing lively academic argument, it also enables companies in the personality testing field to differentiate their products from those of their competitors. For example, you may come across personality tests like the ‘16 Personality Factor Questionnaire’ or the ‘Occupational Personality Inventory’ which measures 32 personality traits. 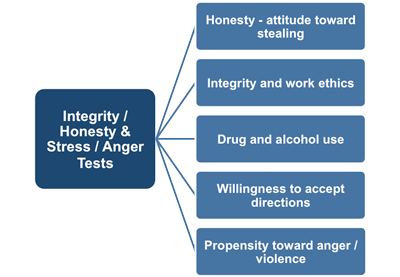 These tests do not measure the big 5 personality traits plus others. They are simply measuring facets or sub-traits of the big 5 and according them more or less emphasis, depending on the particular viewpoint of the test designer. An example personality profile is shown below. It is important to remember that low, average, and high scores on a personality trait questionnaire are neither intrinsically good nor bad. A particular level on any trait will probably be neutral or irrelevant for most activities, helpful for accomplishing some things, and detrimental for accomplishing others. As with any personality inventory, scores and descriptions can only approximate your actual personality. Whilst all of this may be true, in the real world your test results will have a significant influence on your chances of being employed. Your personality profile is no use to employers unless they have some way of knowing how your profile compares to the requirements of performing well in a particular role. Before the results can be used to select suitable candidates for a particular job, results of similar questionnaires must be produced in the population as a whole and also for those people already working successfully in the relevant job. For example, there are some jobs which have become synonymous with extrovert personalities. Sales is one example, it is difficult to imagine a successful sales person who is not naturally extroverted. The qualities associated with this personality trait; friendliness, gregariousness, assertiveness, cheerfulness, and a high activity level are all qualities associated with successful sales people. For employers to look for these qualities when recruiting sales people makes sense and is exactly what you would expect. However, for almost all jobs, not just sales, employers prefer extroverts over introverts. Even people in highly technical jobs work in teams for much of the time, they need to get on with people and get them to cooperate to get the job done. Most employers take a long term view of the people they employ. The person employed today to input figures into spreadsheets could be working as a supervisor or manager in a couple of year’s time and it is better if they appear to have some of the attributes that will be needed in the future. In addition to the Big 5, there are other personality traits that are of particular interest to employers. People applying for jobs in retail, banking, or the security services industries are often asked to take an integrity test which claims to predict if they will lie, cheat, or steal on the job. These personality tests are administered by an estimated 6,000 US organizations and taken by as many as 5 million people each year. These tests may be either self-contained or the questions may form part of a general personality questionnaire. Stress is often defined as ‘anger turned inwards’ and is implicated in a long list of medical conditions from migraines to heart attacks. It is also a precursor to ‘workplace rage’ which along with ‘road rage’ and ‘air rage’ is rapidly increasing. Employee illness and violence are very expensive from an employer’s point of view and questions aimed at screening out stressed or angry candidates are finding their way into personality questionnaires. The modern workforce is made up of people from a diverse array of ethnic and cultural groups, including many persons for whom English is not the primary language. Some of these individuals may experience difficulty on standardized tests due to cultural differences or lack of mastery of the English language. Depending on the nature of the job for which they are applying, this could mean that their test scores will not accurately predict their true job potential. These situations must be handled with professionalism and sensitivity. Properly handled, this can be accomplished without compromising the integrity of the assessment process. Accommodation may involve ensuring physical accessibility to the test site, modifying test equipment or tests, or providing other forms of assistance. Giving extra time for certain kinds of tests to test takers with dyslexia or other learning disabilities and administering a braille version of a test for the blind may be examples of reasonable accommodation.